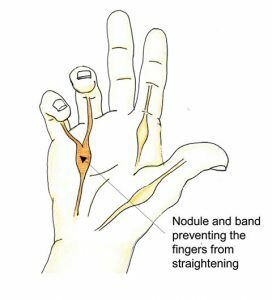 This page will provide you with information about dupuytren’s fasciectomy. For further details, please speak to your consultant. The signs of this disease are shown by what looks like scarring on the palms of your hands and the fingers. Fingers curling towards the palms happens when the fibrous connective tissue in the palms has thickened. This condition is known as Dupuytren’s Contracture. Surgery not only straightens the fingers but also makes using your hand easier. An alternative treatment is a needle aponeurotom but you are left with a greater risk of the condition recurring. Radiotherapy is available as a treatment option at Cancer Centre London. Please click here for more details. As of yet, it is uncertain whether an injection of collagenase into the band of scar tissue is effective, as this drug and treatment are new. This procedure may be performed to different degrees: cutting the fibrous band in your palm or taking away the scarred skin and covering the area with skin grafts. The are a number of anaesthetic procedures available for this operation. Regular exercise of your hand and fingers will help recovery and get your hand back to normal more quickly, however all exercise should be approved by your doctor first. Your hand may take a little time to feel normal after surgery. This surgery is recommended to reinstate hand function and to straighten your fingers.